Various locations. Thursday 20-December-2018 / Friday 28-December-2018. This all started because it was our turn to visit Mary's mum. Plus we have a timeshare in Ambleside for the Christmas week. So we decided to pile everything into the car and drive to Scotland and back breaking our journey in various locations along the way. First stop was in Penrith to visit our friends Kate and Nigel and their dog Eli. Had a nice meal with them and then joined their friends for a pub quiz. We got the hang of the pub but not necessarily the quiz. We did not win. 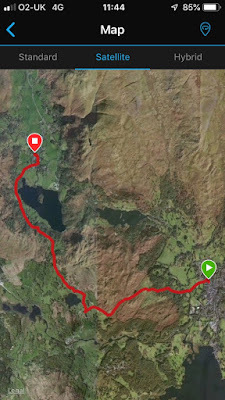 Next morning it was a short transfer to Ambleside for a stroll round the town, a pint in one pub and a meal in another. Lunch with Mary's Uncle Ronnie and Avril at The Gateway Inn. We joined up parts of two different walks to give ourselves a good long yomp. Time: 5:53:03. Distance 14.00 km. Calories burned: 1,833. Pace: 25:13 min/km. 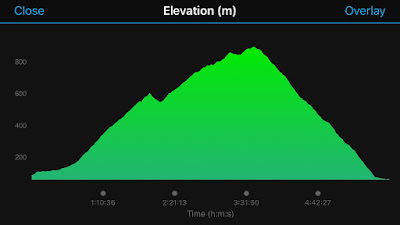 Elevation gain: 914m. Morning view back down the valley. Then near the top the mists came down and the temperature dropped and we lost the path. It was a bit scary for 20 minutes or so as we blundered about trying to find any path - they split and recombined around the peak. My fingers were frozen and it is hard to work a GPS device when you can't feel anything. Eventually we found our way back to one of the paths on the downward slope. Much relief! Heading back down, panic over. That evening after a soak in the bath it was out for a meal at the Drunken Duck. A bit of gentle shopping in Ambleside after the exertions of the day before and evening Meal at Rothay Manor. Monday we drove up to Mary's mum's where we cooked her lunch and then went back to the Gailes Hotel to relax. We dined in by ourselves at the hotel. Only in Scotland would you find Haggis Pakora on the menu. A new kind of fusion cuisine: Indo-Caledonian. As wikipedia drily quotes: "Haggis pakoras have become popular appetizers in Indian restaurants in Scotland, where they appeal to the national predilection for deep-fried food." We went round to May's for present opening then brought her back for Christmas lunch in the hotel. After lunch we sent her home by taxi. Boxing day morning we, again, cooked lunch for May then headed back to Ambleside for timeshare part 2. The day's walk was a gentle stroll to Grasmere for lunch and back via the coffin route and Rydal. Time: 1:54:59. Distance 8.52 km. Calories burned: 665. Pace: 13:30 min/km. Elevation gain: 225m. Lovely textures of granite, pebbles and leaves. Time: 1:25:05. Distance 6.56 km. Calories burned: 513. Pace: 12:58 min/km. 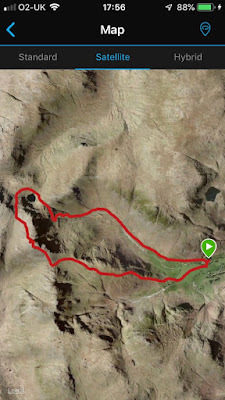 Elevation gain: 119m. Proper woods - mixed deciduous, none of this Forestry Commission pine mono-culture plantations. The other end of the coffin route, coffins used to do it in the reverse direction. The evening meal was at The Old Stamp House Restaurant, formerly the work place of Wordsworth. No a la carte menu, only one tasting menu from which you could choose the 5 or 7 course version. We, of course, went for the max with matching flight of wines to match. Delicious. And back to London for a couple of days to swap the contents of the suitcases and two meals out with friends over the next two days just to keep the over-indulgence theme going. The support acts were good and with almost Swiss efficiency came on at the appointed time and played for their allotted half hour. I think every Swede in London was in the audience. We listen to the album Long Gone Before Daylight which Mary plays on a regular basis and almost every time I ask "Who are we listening to?" So curiously familiar and yet unknown. The Cardigans set was them playing the complete Gran Turismo album including the excellent single "Erase/Rewind". "Perrson and her band emerged a little after 9pm and set out to deliver a masterful performance of a truly iconic record with the eerie Paralyzed washing over the venue and transporting us back to the bands heyday before first major single offering, Erase/Rewind had the crowd dancing and belting along with the Swedish hit-makers. All this preceded by an excellent meal at The Dartmouth Castle gastro pub. Top notch evening.